8 Reasons Your Cardio Workouts Aren’t Working « Burn The Fat Blog – Tom Venuto. So, you’ve started doing cardio to burn fat and get in shape. Perhaps you’ve started running every morning or taking a walk on your lunch break. Or maybe you began using the elliptical, stairclimber, or rower at the gym. Maybe you’ve joined a class. But no matter what kind of cardio you do, you’re not seeing the results you want, and you’re not sure why. Well, here are eight of the most common reasons why your cardio workouts may not be working and what you should do about it. 1. You have no goals and no way to measure and track your progress. If you don’t know exactly what you’re trying to achieve with your cardio workouts, there’s no way to tell if and when you’ve achieved it. It sounds brain-dead simple, because it is. But so many people make the mistake of having no goals, which leads to many of the problems in this list. You can avoid these problems if you simply set goals. Establish precisely what you want to achieve and put it in writing. How you set your goals is critically important, so, make sure you get this right. Check out Tom Venuto’s system for setting SMARTER goals, here. 2. You have no plan or program to follow. If you’re just “winging it” when it comes to cardio, that’s like playing the lottery – the odds are against you. As the old saying goes, failing to plan is planning to fail. So, make sure you have at least a basic plan or program structure in place. Your plan doesn’t need to be elaborate or complicated. In fact, it could be as simple as, “I’m going to walk every morning for 30 minutes.” That’s a plan. Or, if you’ve already established a regular cardio habit, it could be, “I’m going to push myself to do a little better every time I train.” Maybe that means going an extra minute each workout, an extra quarter mile or a little faster, so you burn more calories than you did last time. Don’t feel like you need to spend the next three months plotting out a sophisticated blueprint. Just create a simple plan you can stick with. 3. You’re only doing cardio workouts and nothing else. If you have a fat loss or body transformation goal, then cardio is one of the best strategies you can use. But cardio training alone is not the most effective approach for achieving fat loss while maintaining or building muscle. The superior approach would include strength training as well. If your exercise routine currently only includes cardio training, then adding resistance training in addition to the cardio will skyrocket your results. You’ll not only get stronger and more muscular, you’ll get leaner faster and be more likely to keep the fat off for good. You can learn more about the importance of strength training for fat loss here: Aerobic VS Resistance Training For Fat Loss. 4. You’re not training with enough intensity. You’re going to get from your cardio workouts only what you put into them. If you want great results, you have to put in a great effort. There are many ways to raise the intensity level of your workouts, but don’t get lost in the details – the key is that you challenge yourself each and every session. You can go faster or longer, increase machine resistance, decrease the length of rest intervals, or push yourself a little harder in any other way you choose. Regardless, don’t fall into the trap of simply going through the motions or clocking a certain amount of time. Many people fool themselves into thinking that they’re working hard, when they’re not even close to a moderate intensity level. If your cardio workouts always feel easy, then you’re not challenging yourself, and increasing intensity might be the one strategy you need to focus on to break out of a progress plateau. And by the way, it doesn’t matter if you’re using some form of interval training (e.g. HIIT) or longer duration, steady-state cardio. Each method has its advantages and disadvantages, and you can increase the intensity level in either type of workout. Steady state does not always mean low intensity, just lower, relative to interval training. Note: training at a high intensity can help, but is not mandatory to achieve great results from your cardio workouts. What’s more important is progression. 5. You’re not progressing in your cardio workouts. Whenever you exercise, one of your goals should be to get better at what you’re doing – whether it’s cardio training, resistance training, sports, etc. And it’s not just because it’ll lead to a better performance in those activities. Fat loss, fitness and body transformation depends on exercise progression. You see, when you exercise regularly, your body begins to adapt, and as a result, you get better at those activities. You get stronger and build endurance, burn a little fat here and build a little muscle there, among other benefits. As a result, it takes a progressively greater challenge for your body to keep improving. So, one of the your best strategies you can use to keep making progress is to keep upping the challenge in some way, shape, or form. 1. Run a quarter mile longer each week (e.g. 2 miles this week, 2.25 miles next week). 2. Cycle for a minute longer each workout until you reach your goal duration (e.g. 45 minutes), and then increase the speed and or resistance slightly each week. 3. Add one more flight of stairs to your stair climbing workouts each week. 4. Set a goal to burn 10 more calories than your last workout on the elliptical machine. 5. Increase the incline on your treadmill by one degree each workout until you’ve maxed it out. Then, for your next workout, lower it down, but increase your speed. 6. There’s not enough variety in your cardio workouts. As stated before, your body adapts to whatever stimulus you impose upon it. For example, if you do a lot of walking, exclusively, your body will get better at walking by strengthening your legs, improving oxygen delivery, and so on. But if you specialize in any one activity for too long, there comes a point where you start receiving diminishing returns compared to when you started. Your progress may slow down or stall completely (i.e., plateau). You may even start to get worse results or experience symptoms of over-training. One of the best things you can do to avoid this problem is to incorporate more variety into your cardio workouts. It could be different activities (e.g. cycling instead of running), or different training protocols (e.g. interval training instead of steady-state cardio). Or, it could be a mixture of things. The key is that if you’re stuck, don’t over-specialize in any one activity or protocol, and when you notice diminishing returns, change your approach accordingly. If a 45 minute walk isn’t producing the results you want, try a 20 minute interval training workout that alternates walking with bursts of running. If you’re getting bored with an hour of easy cycling, then signup for a kickboxing class. 7. Your cardio workouts aren’t long enough. In an industry fraught with 4-minute workouts and other quick-fix solutions, many people believe that you can get great results in minimum time. It’s true that high-intensity cardio can improve heart health and cardiovascular conditioning with surprisingly short workouts, but here’s the reality: Most people who subscribe to minimalist cardio approaches get minimal results, especially when it comes to fat loss. Suffice to say, if you’re performing very short cardio workouts (e.g. in the 5-15 minutes range), then you could be getting better results if you trained longer. You have to put in the time. Just keep in mind that there is a point of diminishing returns. 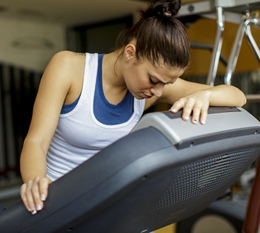 Too much of a good thing can turn bad, and that’s very true with cardio training. You can learn more about that here: Can Too Much Cardio Decrease Your Metabolism? If you’re busy, by all means, do whatever you can in however much time you have available. When time is short, intensity is paramount. If you’ve only got 10 minutes for cardio , then using every one of those 600 seconds to the maximum by pushing up the intensity is efficient training. But don’t kid yourself into thinking that shorter is always better, no matter what the advertisements and fat loss gurus say. If intensity and all else are equal, 20 or 30 minutes would get you better results – more fat loss – every time. Sometimes, your cardio workouts aren’t the problem. It’s something else entirely that’s sabotaging the great job you’re doing in your workouts. For example, you could be doing cardio six days a week with an intelligent and balanced blend of longer steady-state cardio and shorter high intensity interval training. You could have the perfect level of intensity, duration, variety, and progression, among other things. Your whole exercise program might be flawless. But, unbeknownst to you, you’re eating at or above your daily calorie maintenance level, and that causes a plateau or even weight gain, completely undermining all that training you’re doing – and your fat loss results. If you’re not conscious of both calories out and calories in, you often stay perplexed and can’t figure out why all that working out isn’t working. The usual culprit is indeed excessive calorie intake, despite the high level of training. But there could be other simple, but often overlooked factors as well, such as a food intolerance, an unbalanced macronutrient intake (insufficient protein), not enough sleep, and too much stress, among others. With an exponential rise in information sharing online today, we tend to get focused on what’s new in the industry or fixated on trivial details of our nutrition and workout plans, instead of focusing on what really matters. Remember that Pareto’s principle – the 80-20 rule – holds true in your fat loss endeavors: 80% of your results come from 20% of your actions. This is why it’s so important to make sure you have the healthy lifestyle and nutrition basics in place before worrying about tweaking minor details of your workouts. John Sifferman is a health-first fitness coach who has been teaching, training, and coaching people in various capacities since 2006 when he was first certified as a personal trainer through the National Strength and Conditioning Association (NSCA-CPT). Since then, John has worked with hundreds of people from all walks of life – offering services ranging from health club and in-home personal training, to group fitness programs and “boot camp” style workouts at local gyms, public parks, and churches. John joined the Burn The Fat team in 2006 and has served in several different roles in the organization since then such as a Burn The Fat Fitness Training Specialist and also as the Burn the Fat Inner Circle Training Department Manager, among others. John is passionate about helping people transform their lives through the conduit of physical transformation. He has written over 500 articles about health and fitness, and has been featured in Shape magazine, RMAX International magazine, Faith and Fitness Magazine, and on dozens of websites including the Burn The Fat Inner Circle, T-Nation, FitWatch, and Conditioning Research. John is also the creator of The Pull-up Solution, which is a step-by-step pull-up and chin-up training system that helps people rapidly increase their pull-up numbers in three months or less. Learn how John rapidly increased his pull-up numbers and has helped hundreds of people do the same with his unique approach to pull-up training at the official site here: http://ThePullupSolution.com. John lives with his wife, children and akita dog in beautiful New Hampshire. You can get to know his down-to-earth personality and sense of humor at his website www.PhysicalLiving.com, where he writes about health-first fitness and physical culture. You can also check him out on Facebook, Twitter, and Youtube if you’re into that whole stalking thing. I recommend everyone this book and educate yourselves with this one tool in the fight against your old body and have a better new body. I am now doing SO much well and have already recommended this book to couple of my friends. Especially #4, I see it all the time. People going at a snails pace. Sure it’s good that they made it to the gym, but now that they’re there, they need to put in the work. I agree with having a program. It’s better to follow a workout program that you can follow whether you’re at the gym or at home.